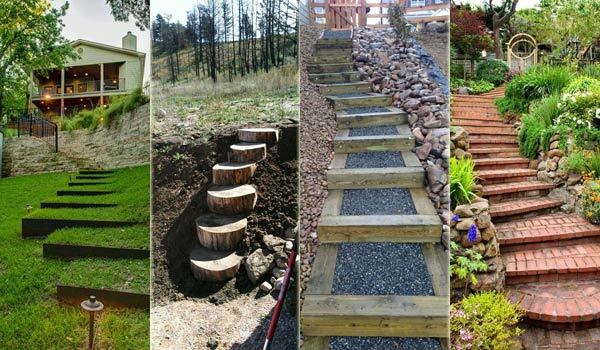 Adding DIY steps and stairs to your garden or yard is a great way to enhance your outdoor landscaping whether they are perfectly flat or happen to sit in a slope. On the other hand, stairs on a garden offers ease of access to go from one level to another and serve as a walkway as well. Garden stairs are less formal than indoor stairs, so you don’t need to follow precise measurements and you can DIY them according to your likes and the theme of the garden. The most popular material for building stairs is the stone. Stone steps and stairs look natural and free forming. Besides the natural stone, rustic wood, concrete blocks and railway sleepers as well as bricks are also ideal materials to construct the garden steps. Browse below ideas and choose your favorite one to boost the garden. Categorized under: Design, Landscape, Projects, Shared.